Any spouse going through a marriage in distress will probably lament on how frustrating it is that their partner is not as interested in patching things up as they are. When things really go downhill, the said spouse is left with even less hope because they feel dumped with the need to save their marriage alone. While this is the sad reality that many partners have to live with, it doesn’t mean that they should abandon all hope in turning things around. The fact that at least one of the people in the relationship is willing to do something is enough reason not to give up. The primary (and most obvious) obstacle is thinking that you can’t make a significant impact by yourself. However, you can get past this perception by realizing that any sort of change begins from within, namely yourself. Thus, the first step to making a change for the better starts with your own initiative. Only by your example will your spouse be convinced to get in on the act. 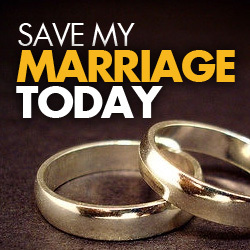 For the ultimate marriage saving guide –> Visit Save My Marriage Today! But then you might think about how unfair it might be that it’s only you that’s doing all the work. However, thinking this way is very damaging to the relationship. As crummy as that feeling might be, your obligation as a spouse requires you to swallow the proverbial bitter pill for the time being. Sometimes, loving someone in the fullest sense means that we have to bear with the sting of inequity that our pride has to suffer through. When you look at the bigger picture, the overall health and longevity of the marriage is more important than our bruised ego. Thus, it will help you greatly to look at your marriage from a different perspective. Specifically, think of your partnership as a sort of business venture that both of you have invested in emotionally. It helps not to dwell on your partner’s efforts in upkeep, and focus instead on what you can do to maintain the health of the marriage. If you insist on being resentful because your own efforts doesn’t match theirs, the relationship will suffer regardless of who gave more. If you have to save the marriage alone for now, pride momentarily needs to take a backseat. The good news is that giving to the marriage doesn’t always have to be done through drastic or extravagant means. In fact, everyday gestures of kindness are often the most powerful acts you can do. You can save your marriage! –> Click here to visit Save My Marriage Today! Come to think of it, the “little” things are actually not as mundane or trivial as you might think. Try to look at it from your spouse’s point of view. Imagine how your spouse would feel if you made an effort to give him or her a small but heartfelt kiss before they went off to work every morning. Also, consider the effect your words of praise or gratitude might have whenever he or she does something that truly pleases you. Just remember that your acts of kindness must be sincere and unconditional. It will defeat the purpose to give with the intention of getting something out of it (i.e. bargaining power in the relationship). A marriage is not a simple you-scratch-my-back-I’ll-scratch-yours type of deal. Taking the first (and second as well as the third) step towards the betterment of the marriage is meant to awaken the same sense of initiative within your partner, and not necessarily for them to respond to your loving act per se (although of course, that wouldn’t be a bad thing either!). On the surface, this way of thinking might appear to have little or no effect in the grander scheme of things, especially since the intended results won’t happen overnight. While it may take time for your partner to come around, he or she will be moved by your example and become just as interested in working on the relationship. Therefore, wanting to save your marriage alone is only the beginning. In time, the habit of giving freely without expectations will eventually turn your relationship into a two-way street.